Click here to view listings in the Varsity subdivisions of Varsity Estates, Varsity Village or Varsity Acres. Homes for sale in Varsity range from condos and townhomes in the low $200,000’s to homes from the mid $400's all the way up to estate and luxury homes of $1 Million or more. Select your price range or specific Varsity real estate listings below. 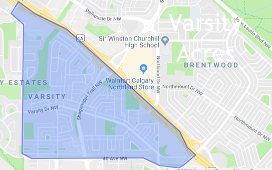 Developed in the late 60s, Varsity is one of the most desirable residential neighborhoods in the North West quadrant of Calgary. Perched atop a plateau on the north of the Bow River Valley, the neighborhood comprises of three major areas namely the Varsity Estates, Varsity Village and Varsity Acres. The community in Varsity is primarily notable for its single detached dwellings that make for a chunk of all residential properties in the area. While the Varsity Acres and Varsity Village have been developed with a similar street pattern of rear lanes, folded grids, and cul de sacs, the Varsity Estates can be rightly touted as the most upscale of the three with wide detached lots sans any rear lanes. 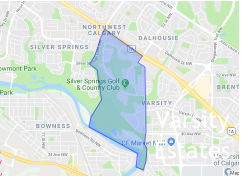 With its close proximity to the Silver Springs Golf Course, local schools, immaculate parks and downtown Calgary, the Varsity Real Estate forms an ideal location for young couples, growing families, and even retirees. While you can find stylish apartments starting around $250,000, the price for the high-end detached homes can go as high as $1 million+. 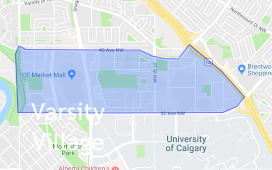 Schools: for specific Varsity homes, please refer to the designated schools search tool on the Calgary Board of Education and Calgary Catholic Designated School websites. For a Report Card on School Rankings of Calgary Schools get in touch with one of our Varsity Real Estate agents. The Varsity Acres School offers a caring and supportive community where the students from Kindergarten to Grade Six are provided a dynamic French Immersion program and encouraged to uncover their true potential. The Marion Carson School opened its doors for the first time in September of 1969 and offered a diverse learning environment for the students to not only achieve academic excellence but also understand the world around them. The Christine Meikle School offers a dynamic setting for both junior high as well as high school students that have moderate to severe cognitive disabilities or complex behavioural, sensory, emotional, learning or medical needs.